Documentary looking at the challenges facing the new Crown Prince of Saudi Arabia. This episode examines the leader's commitment to end extremism and to return to moderate Islam. Saudi Arabia stands at a crucial crossroads facing unprecedented change. The Kingdom has long enjoyed seemingly inexhaustible wealth and untold power and influence. But the House of Saud is accused of spreading extremist ideology and even supporting violent extremists. 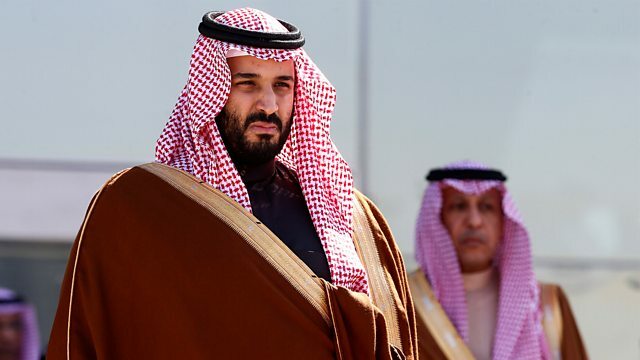 This series looks at the challenges facing the new Crown Prince, 32-year-old Mohammed bin Salman, who has pledged to transform the country. The first episode examines the new leader's dramatic commitment to end extremism and to return to moderate Islam. Travelling from eastern Europe to India, and across the bloody battlefields of Syria and Yemen, the programme traces the impact that huge amounts of Saudi cash and weapons have had around the world. In recent years, Saudi Arabia has worked closely on counter-terrorism with the west and revolutionary change is now promised inside the Kingdom. But growing regional conflict with Iran has now placed the country at the heart of the crisis in the Middle East. The programme asks whether this most powerful and secretive country can now be a force for stability or a force for chaos in the world.